With a brand-new 20,000-sq.-ft. addition, Manitowoc Tool & Manufacturing LLC (MT&M) now approaches 140,000 sq. ft. of manufacturing space at its facility in Manitowoc, WI. Under roof, the family-owned company does seemingly everything under the sun to turn sheetmetal blanks and coil into parts and assemblies for lawn-and-garden, trucking, automotive, RV, lighting, lamination and other customers. MT&M provides tool and die design and build, and three-shift metal stamping in annual volumes from 1000 to 3 million-plus parts via 18 presses in capacities from 60 to 800 tons. Other processes include waterjet cutting, and a host of value-added services including spot welding and assembly. It’s a far cry from 1965, when, as Manitowoc Tool & Die, the business debuted in a downtown Manitowoc garage as a die builder. Over the years, as the company’s production machining took off, the business was split into Manitowoc Tool & Machining and Manitowoc Tool & Manufacturing to give each segment a better opportunity to grow. MT&M grew its space—the just completed expansion is number eight—to house increasing capabilities and state-of-the art technology. That tradition continues. 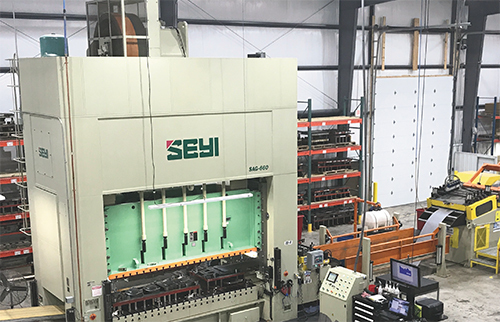 In 2014, the 135-employee-strong company began adding new Seyi mechanical presses, first a 440-tonner followed by a 660-ton unit. Both feature coil-feed lines from Dallas Industries, Troy, MI. Another 660-ton Seyi press arrived at the end of 2016, with Dallas feed equipment now on its way to support that unit (the line currently carries a temporary feed setup from Dallas). In its stamping operations, utilizing progressive and hand-fed dies, MT&M works with stainless and mild steels as well as aluminum. Material thickness ranges from 0.010 to 3⁄8 in. with a fair amount of prepainted sheet feeding the presses. Reliable straightening also was a needed feature. “To us,” says Reinhart, “setting up the die is the easy part. The hard part is the back end, keeping the material straight in order to correctly feed into the tool. To handle wider and increasingly tougher materials, MT&M has opted for 48-in.-width capacity on the beefed up coil-feed line it has ordered from Dallas for the newest 660-ton press. This line was specified to handle mild and high-strength steels. The 440-ton unit features a 42-in.-wide feed, threading table, straightener, and 20,000-lb. by 42-in.-wide-capacity reel and coil car. The older 660-ton press boasts a 48-in.-wide feed, straightener, and 20,000-lb. by 48-in.-wide-capacity reel and coil car. The lines on the 440-ton and first 660-ton presses are outfitted for feeding mild and high-strength steel as well. Along with its new mechanical presses, Manitowoc Tool & Manufacturing has invested in the latest coil-handling technology to feed them. This 48-in.-wide-capacity coil line feeds a Seyi 660-ton press, and gives the metalformer tighter control of material straight through the tooling while keeping the material finish pristine, a must given that Manitowoc produces a large amount of cosmetic parts. With Dallas Industries’ AutoSet, adjustable points on a feed line such as straightener rolls, edge guides, coil guides and feed passline automatically are positioned based on job recipe, which provides quick, consistent setup for each job, according to company officials. And, because MT&M produces a large amount of cosmetic parts, Reinhart appreciates feed features designed to prevent material marks. Many servo-feed controls use a trapezoidal motion profile that creates quick, jerky motions that can cause slippage, material damage and added stress to machine components, say Dallas officials. The company’s ProfileSelect mode, conversely, uses a sinusoidal (cam-motion) profile. This reportedly results in a smooth feed motion that utilizes 100 percent of the press-feed window, reducing stress on the material and the feed’s mechanical components. Another feature, Sync-Loop, synchronizes the feeder and straightener speeds to enhance a material loop’s stability and control. Loop-height setpoints can be stored in job recipes, providing tuned feed and loop control for each job. As a job shop with a dizzying amount of part numbers, a synchronized line, from feed to press to tooling and beyond, means less costly and time-consuming babysitting. By adopting the latest technologies such as these new feed systems, MT&M can remain competitive and cement itself as a leading-edge manufacturer, according to Reinhart. “We want to run the latest equipment, from the die shop to the press room,” he says. In its forward-thinking technology quest, MT&M recently added a quality-control room with a scanning arm and tabletop coordinate-measuring machine. In addition, the company, during MetalForming’s visit, was preparing to go live with a Merlin dashboard system. MT&M also has activated two new press-tending robots to assist in appliance-panel production on the newest 660-ton press. In addition, the company is looking at new 1000- or 1200-ton presses, possibly servo-driven, to reside in the plant’s newest addition and add to MT&M’s capabilities. Within the past year, the company has embarked on a 5S journey (“We don’t think that will ever be finished…it’s a continuous journey,” says Reinhart) and already results are apparent throughout the practically spotless and orderly plant. The atmosphere is aided appreciably by the recent addition of LED lighting throughout. And speaking of atmosphere, all 139,000 sq. ft. of MT&M are climate-controlled, offering comfort for employees and providing an environment that prevents material rust. In fact, some customers have the company store parts onsite to avoid rust issues. Beyond the technology, MT&M invests in its people. Reinhart speaks with pride about its tool design, building and maintenance capabilities, stressing that the company has seven tooling engineers on staff and can readily build and maintain its own tooling as well as provide tooling to outside manufacturers. As evidence of how much the company values its employees, during our tour Reinhart pointed to the lost-time scoreboard hung prominently on the plant floor. It read 3780, or more than 10 years without a lost-time injury. That safety record is no accident, as the company, according to Reinhart, strives to help its employees be as conscientious and knowledgeable as possible about their work environment. See also: Dallas Industries, SEYI America, Inc.